Question of the Week: What is your favorite photo project you have given as a gift? This is the third week of the 7 Weeks of Christmas photo contest! 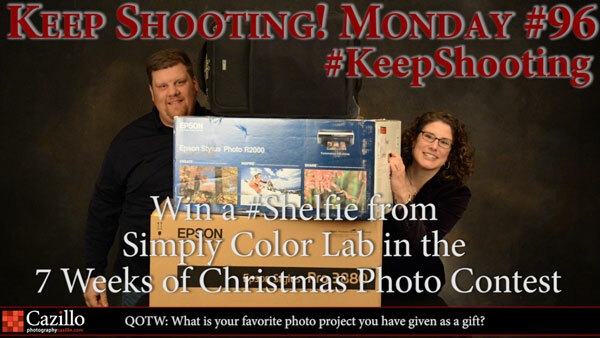 This week we are giving away a Shelfie from Simply Color Labs. In order to win post the 3 images you would order for your Shelfie and we will choose a winner which will also be entered into the grand prize drawing for an Epson Printer or ThinkTank Photo camera bag. See complete rules to enter here http://cazillo.com/articles/keep-shooting/448-7-weeks-of-christmas-photo-contest-win-an-epson-printer.html Keep shooting! Oh I've taken lots of fall foliage and sunset photos as I systematically learn the intricacies of my new 5200 and set of excellent lenses I've purchased. I have used one of your ideas. Had some of my images printed at Staples on their large printer on heavy stick and purchased little easels at AC Moore. Have several around the house and will change out to provide variety and showcase more of my new work which is really super if I may say so myself! Will share photos soon. I've been watching from very close to the beginning. I've picked up good tips along the way. The shows are the right length, some other video makers go on forever, and frankly I only watch a few minutes of them. Who has an hour plus to watch? You both do a great job, but the most amazing thing is the transformation of the somewhat shy school teacher into a hot looking professional photographer who can keep right up with Mr. Greg. Nicely done Kathy! Greg, whats it really like to work with a stud? Great show. The best gift I can give? Me, my time and equipment that I set up for a shoot. My knowledge and time for posing and editing. I do charge for the ink and paper. But most important of all is my desire to provide the less fortunate with portraits they can cherish for years to come.